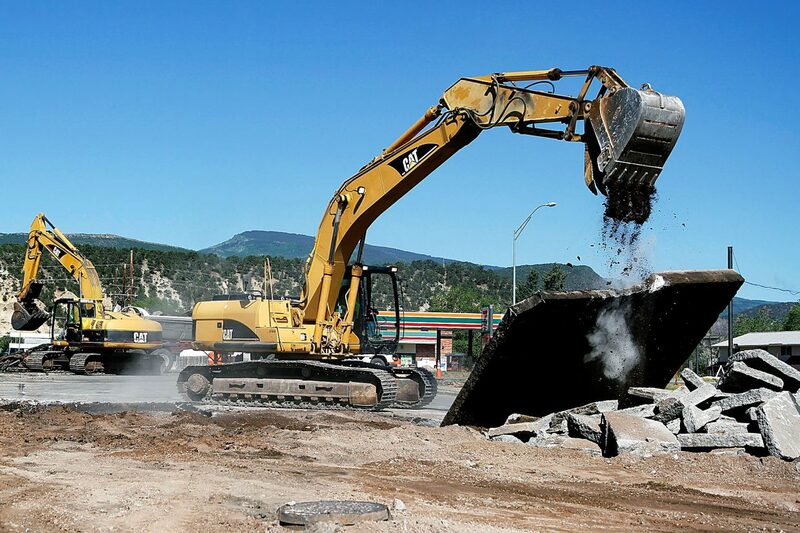 Residents and business owners near the intersection of Main Street and Highway 133 in Carbondale are settling in for a summer of road closures and construction as part of the Colorado Department of Transportation’s planned improvements. Stage 2, which will last around six weeks, kicked off last week with the closure of east Main and the removal of the existing traffic signal. When the project wraps up in the fall, Highway 133 will gain a center turn lane and the Main Street intersection will host a roundabout. In the meantime, locals face some challenges. On Wednesday, workers were obliged to direct traffic at Colorado Avenue and 133, which will serve as the primary detour for traffic to and from Main Street. On Thursday and Friday, Carbondale Police issued more than 70 warnings to drivers attempting to use the Carbondale Plaza parking lot as a through street. A cattle drive passed through the construction zone without incident Friday morning, and by the time the First Friday crowds began to descend on the town in the evening a temporary traffic signal was up and crews were ready. “Once we had that temporary light in place things have been moving very smoothly out there,” CDOT spokesperson Tracy Trulove said. Having passed some of the town’s toughest tests, CDOT and United Companies construction will face the daily challenges of providing continued access to businesses and safety for residents. Joan Langer and Jake Boyles of Crystal River Spas have already noticed some impacts at their location on the 1100 block of Main Street. “People have been battling to get to us,” said Boyles. Boyles acknowledged that the closure was inevitable, but hoped more could be done to remind shoppers that local traffic is permitted past the Eighth Street detour sign on Main Street and businesses are open. Cathy Britt, owner of Dancing Colors Studio, thinks she’ll continue to see her regulars but expects to lose the drop ins. That’s not what worries her most, though. “My biggest concern is the kids and the pedestrians,” she said. Britt is one of many Carbondalians who fears the roundabout will prove a problem for foot and bike traffic even after the construction is completed. Langer thinks an overpass is the logical solution. According to Trulove, CDOT is not opposed to an overpass but is unlikely to fund one. Another organization, such as the town of Carbondale, would have to take on the design and cost. Ryan Barkman, of Heidi’s Brooklyn Deli, is more optimistic. He thinks improvements near the intersection of Highway 133 and Highway 82 may draw more passersby into Carbondale. Heidi’s has actually seen an increase in sales as construction workers stop in for lunch. City Market, the town’s largest retailer, has had no negative impacts from the construction so far, according to manager Marty Martin. Several business owners in Sopris Shopping Center to the northeast of the project also reported little to no impact. That may change when construction along the highway shifts to the other side of the road in late July, although CDOT intends to maintain access throughout the process. Meanwhile, residents along the Colorado Avenue detour are taking the increase in traffic in stride. The Carbondale Chamber has set up a website at carbondale133.com for the public to keep up to date on the project. Folks can also direct questions to the project hotline, 970-688-4988, or email SH133@publicinfoteam.com.